I can’t believe I’m introducing yet another article with this but, as you might know, I am intending to produce my own photographic zine and in an attempt to further my understanding go the printed medium, I have been acquiring a number of zines as research. Part of said research has allowed me to discover an up-and-coming photographer: Spencer Reed. Spencer is an active member of the film photography community; he was a regular contributor to the discussions in Nick Exposed’s livestreams, he makes the occasional video on YouTube speaking about film, and now he’s producing printed work for us to enjoy. 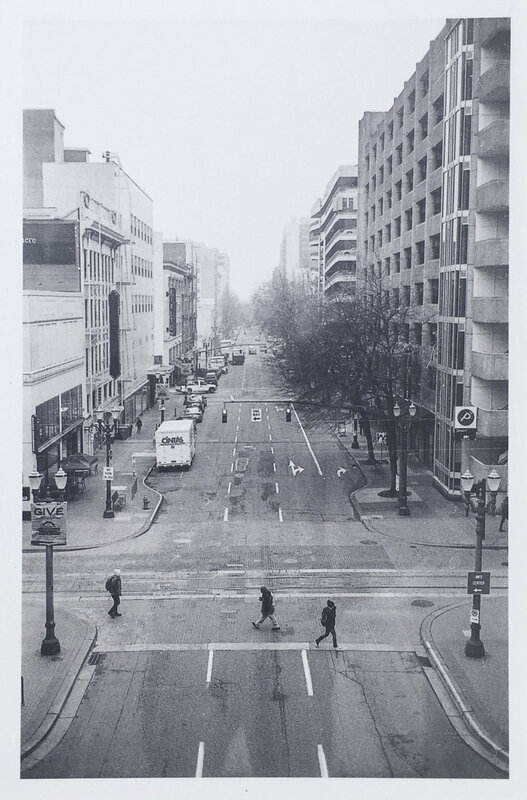 MY CITY is a monochromatic zine about Spencer’s home: Portland, Oregon. It looks to study the shapes of the urban landscape which is a crucial part of his city. I personally find these studies of cities and cultures to be of intrigue. As a UK based photographer, it’s always a pleasure to experience someone else’s home through their eyes - particularly when it’s so different to my own. This is one of the reasons that I enjoyed Jules Le Moal’s From Montmartre With Love so much, and it is no different for Spencer’s MY CITY. It’s nice to experience Portland, but it’s a delight to experience it through Spencer’s eyes. This zine is different to most zines I have looked at. The way it differs mainly is the materials used. Spencer has home printed and stapled this; it’s a homemade zine. It makes for a really charming piece. In a similar sense to how Jules Le Moal’s From Montmartre With Love felt personalised with the thread binding, so too does this in the manner it’s been printed and stapled. I don’t think it’s unfair to say that this has a different finish to a zine that you might have professionally published. I want to draw attention to what I have just stated, because I feel like it could be taken the wrong way: it’s different, not better or worse. Spencer has carefully considered the images, the layout, and, indeed, the printing method. Even though the paper may not yield the dark blacks as well as other papers, or the feel isn’t the same of a ‘premium’ product, this zine has a unique character to it. It feels like generic office paper - and I love it. It really screams “This is an indie production, and I’m owning it”. I just love it. 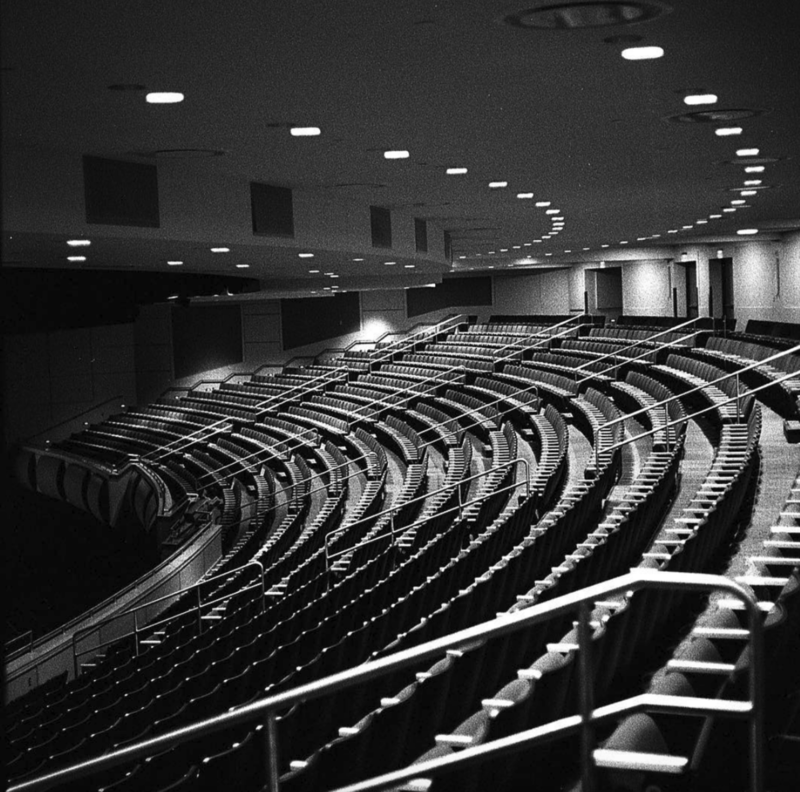 Then, I wish to reflect on some of the images; in particular this image of, what looks to be, a auditorium balcony. This image is brilliant. The composition is incredibly aesthetically pleasing. From the leading lines created by the lights mirrored by the seats, to the layering of the rails, this image ticks a lot of boxes for me. The tonality and contrast is also great: from the deep shadows caused by the seats to the whites of the lights. This just demonstrates how Spencer has developed his eye. If you follow Spencer on Instagram (which you definitely should), then you would have seen that Spencer’s eye has been evolving over the recent weeks and months, and it’s a joy to witness. This zine feels like evidence of that journey. I also wish to recognise the variety in this zine. Even though the narrative of this zine remains constant, you can see that Spencer has tried to add variety, by changing the subjects he captures and how he captures them. These two spreads demonstrate this well. In the first you can see a tall, curvaceous building, and the image is taken from, assumably, the ground. Where as in this next spread, we are viewing these harsher zig-zag and square shapes from height. Even though they both explore architecture, they’re very different.I feel that Spencer has really applied himself to each scene, and I think it speaks volumes of his hard work. I then wish to reflect on something that’s not strictly part of the zine, though I think it’s brilliant: Spencer included a small print with the zine. Of course, the image is technically great with an awesome perspective, but it’s also something that can go on my wall. Even though I would love to wall mount all the zines I’ve collected, I want to enjoy them as zines, and so they're on my bookshelf. However, I still wish to display their work in my home, and this print allows me to do that. Now I have a reminder of the zine that sits above my work station. A charming zine, with lots of character, lovingly made, by an up-and-coming photographer. If that doesn’t tell you that this zine is worth picking up, then I’m not sure what will. I gather that Spencer has a handful of copies left, so if you want to support a member of this community whilst bagging yourself another zine to add to your collection, be sure to check out Spencer’s Instagram, and send him a DM to purchase one. And whilst you’re there, give that guy a follow, and be sure to check out his YouTube channel. Thanks again for supporting YOUR EXHIBITION by reading this article. It’d mean the world to us if you would support the creators we have featured thus far, so browse the other A LOOK AT: articles we have published, and make sure you follow all the relevant people. If you’d like to learn how you can contribute to this community, read about how you can feature here, or get in contact with us via our Instagram page.